Today we’d like to introduce you to Mike Nourse. In 2004 three area art instructors started offering free art classes to learn about learning. The goal was to improve as educators while supporting the development of Chicago artists. When students started asking for more, a residency model was adopted and Chicago Art Department was born. Since that time CAD has evolved to see 15 Resident Artists per year develop their practice by leading studio, exhibition, and learning programs – as a result, all of what happens at CAD comes from the artists in residence inside of their 12-month terms. Today, a 501(c) 3 not-for-profit, CAD is an artist-run organization which centers on the practices of our Resident Artists, and the exhibitions, public programs, and partnerships that come from their work. Because CAD’s roster of artists changes each year, the content of what happens at CAD shifts, staying contemporary and relevant, but always focused on cultivating new artists, conversations, and advocacy for what matters in Chicago. We shift what we do based on the group of artists we have each year, and sometimes that can be a lot of work. Based on the group of CAD artists in any one year, we might focus more on education, exhibitions, or partnerships for example. Public events and exhibitions could be more 2D one year, 3D the next, or analog one year and digital the next, or visual art one year and performance-based the next. So these shifts can take work to accommodate and communicate – but these are exciting challenges. CAD is fortunate to have support from foundations, but it has taken many years to get that support by advocating for the value of our unique model. The bigger challenge stem not so much from the execution, but more from a community working to change the perception of how the world we live in see artists as makers, as opposed to professionally and civically-driven people who think larger than themselves and aim for more than making. 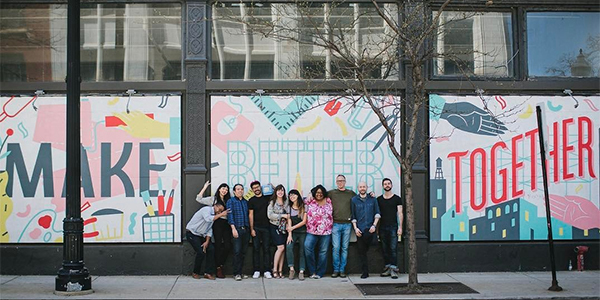 So, as you know, we’re impressed with Chicago Art Department – tell our readers more, for example what you’re most proud of as a company and what sets you apart from others. Chicago Art Department is known as an alternative art space with exciting artists, events, and programs. Our Resident Artists are varied in backgrounds, and as such our programs showcase varied art forms while tackling topics that matter. Our artists can be found in the news, in print, on television, featured online, each leading conversations stemming from their practice and work as Resident Artists at CAD. We often work with Resident Artists who moved to Chicago from other countries, cultures, and economic backgrounds. Bringing them together as we do results in a vibrant community of people supporting each other as a cohort, through inspiring relationships with each other, partner organizations, and our audience. We are most proud that through their studio work, public programs, and exhibitions, our community continues to add not just to the contemporary art world, but also to the social fabric of this great city. Chicago has all the parts needed to be a world-class city that supports the best artists on the planet. There is history, general support for the arts, and passionate audiences who love their artists. We love that about this great city. The challenges in Chicago stem from historical systems that can marginalize certain communities, minimize the work of cultural leaders and artists, place resources in the wrong hands, and disproportionately benefit those who might not need it instead of those who do. Chicago is not the only city with such a history, and Chicago Art Department is not the only organization that works to address these social and historical issues. That said, what makes this city great is the resolve of its artists, citizens, and organizations to make it better.